Those of you who follow the blog know that we’re new RVers since September and are already looking to upgrade to something with a few more amenities than our T@B. We’ve been back & forth for over a month trying to decide what we want our next trailer to be. We were pretty sure we narrowed it down to the Serro Scotty HiLander, and even made a trip to western Pennsylvania to talk with the owner of the company. However, the Indy RV Show has been in town the past week and on our second trip to it this past Friday night, we ran into a nicely priced and bigger alternative: The CrossRoads Zinger. 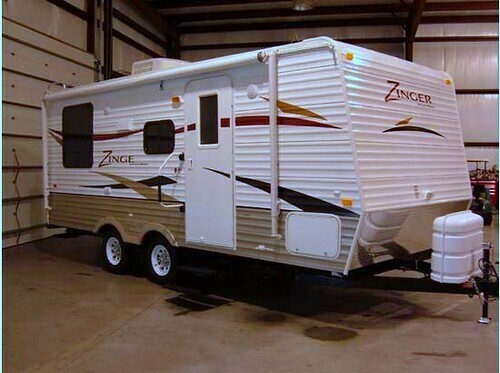 The Zinger is a nice entry-level travel trailer, built by CrossRoads RV near the RV manufacturing hub of Elkhart, Indiana. This is a very nicely built model, with ample room and other goodies. 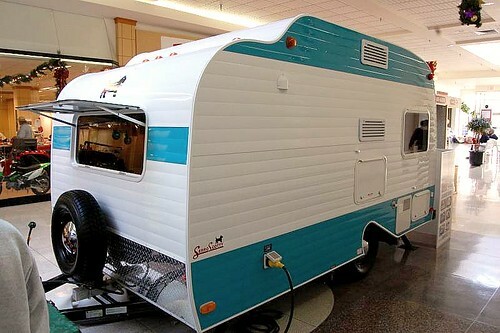 Compared to the Scotty, it’s surely a typical looking “box” trailer. So this leads us to our current weighing of pros & cons. The Scotty has the cool retro 60’s look, but is smaller. The Zinger is a box on wheels, but has more room for a similar price as the Scotty. The Scotty could fit in a garage, but the Zinger couldn’t. The Scotty weighs 2500 lbs and the Zinger weighs about 4000lbs. The heavier load would likely require me to have my 200,000-plus mile transmission rebuilt. The Scotty checks in at 15’9″ from tongue to tail and the Zinger measures about 23′. So these are some of the variables we need to think about before making a decision. And of course, we won’t have to make a decision until we sell our T@B. So, what are your thoughts? Feel free to comment below!